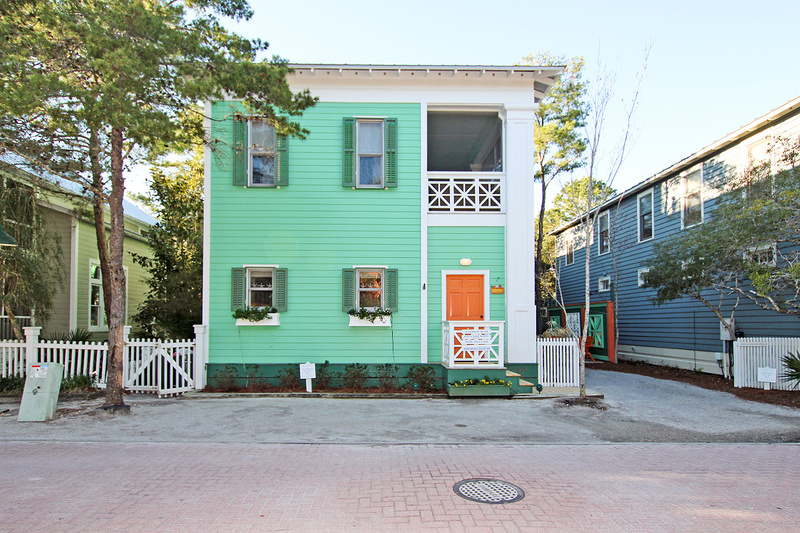 This is an Extraordinary Beach Vacation Cottage on the East Side of Seaside, FL! Blessings by the Sea is an extraordinary beach vacation cottage on the east side of Seaside, FL. With four bedrooms and five baths, it is ideally located near the fitness center, swimming pools, Ruskin Place shops, Seaside Chapel and Town Square. Better yet, it's just a short walk to the pristine beach. While the bright exterior colors remind you of old-time Florida beach houses, the inside is all extravagance. On the first floor is a sleek, modern kitchen equipped with beautiful stainless steel appliances. The living room has soaring, open ceilings and enough furniture for everyone. Original art can be found throughout this home. The king-sized, downstairs master bedroom has its own full bathroom with walk-in closet and plenty of drawer space for storage. There is also a half bath on the first floor for convenience. On the second floor are three additional bedrooms. The first, a king-sized bedroom with a private bathroom and walk-in closet, includes an attached bonus room with two sets of twin bunk beds for the kids, ideal for young families or “sleepovers”. The second bedroom has a queen-sized bed with a private bathroom and walk-in closet. The third bedroom offers newly-added twin bunk beds with access to a half bath. All upstairs bedrooms have access to a long, gorgeous screened-in balcony furnished to comfortably seat eight and is ideal for a kids’ hangout or morning coffee. All four bedrooms have HDTVs with Apple TV. What really sets this vacation home apart is the spiral staircase leading to one the best tower views of the town, offering a 360-degree view of Seaside and gulf views. It is a perfect spot to enjoy a glass of wine while watching the sun set, Outside you will find one of Seaside’s most unique outdoor settings - a lighted, large deck and mirrored exterior wall, complemented by a hammock, grill and outdoor private shower.